The Special Needs SCHOOL Survival Guide looks like a thin book but it has one of the highest “fact per page” scores of any of these types of books. It's really packed with information. It’s not the kind of book you can simply read cover-to-cover. Instead, you’ll find yourself wanting to stop every few minutes to note an activity that you might want to try or a web site you might want to visit. The book focusses on the resolution of school problems for kids with many different kinds of special needs. There's some information for parents, particularly in the early sections but the bulk of the book seems to be aimed at teachers and school occupational therapists. The first chapters deal with the Individualized Education Plan (IEP) and the 504 plan. The book covers what they are, how they differ, how they work and what parents and teachers can expect to get out of them. From there the book dives into occupational therapy in school in detail, In particular, it covers exercises which can help specific areas of academic and social learning and provides many links to diverse and relevant information sources on the Internet. Early chapters cover many different aspects of handwriting including pre-handwriting preparation, letter reversal, pencil grip and techniques for dealing with left handers. There's also a good chapter on fine motor coordination. Each chapter contains loads of tips and therapies, most of which don't require any significant resources. There are also plenty of “out of the pocket activities” (tips). Nearly every chapter ends with a long list of relevant URLs for further reading. 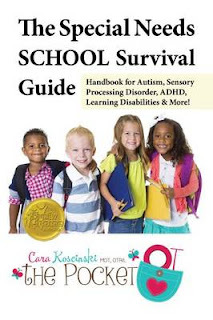 The author, Cara Koscinski, has a children on the autism spectrum as well as OT qualifications - and it shows in her writing. She writes both as a parent and a teacher. She discusses her personal experiences with other OT’s and highlights the problems and benefits associated with various therapies. She makes some very interesting personal observations, particularly relating to “letting your child spin”. This is a great book for teachers and OTs and it's ideally suited to people who encounter lots of children with various differences every day. It has lots of good information on identifying specific conditions including co-morbids and there are entire chapters dealing with some of the major differences. In particular, the chapters Autism and Sensory Processing Disorder (SPD) and ADHD are particularly good. They contain some very good insight (particularly from the point of view of the child). 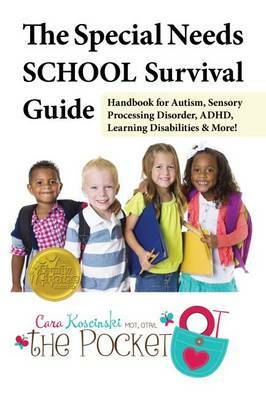 The Special Needs SCHOOL Survival Guide: Handbook for Autism, Sensory Processing Disorder, ADHD, Learning Disabilities & More! By Cara Koscinski MOT OTR/L (The Pocket) is published by Future Horizons and is available in paperback from Future Horizons, or in paperback or Kindle format from Amazon. 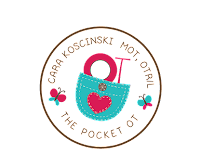 Cara Koscinski writes for the Pocket Occupational Therapist at http://www.pocketot.com/ it’s a great site with lots of good information and freebies. Well worth a visit.